Spring announces its arrival in many ways. 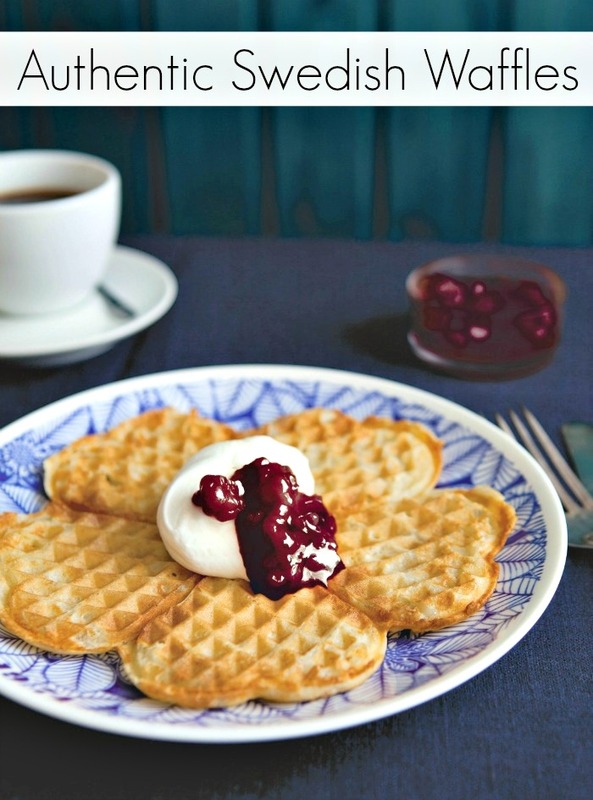 But in Sweden, golden waffles with jam signal the coming of spring. 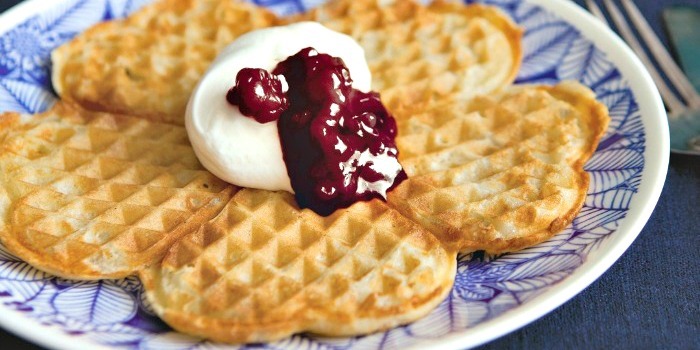 Yes, only an Authentic Swedish Waffles Recipe will do! When I lived in downtown Chicago, there were several Swedish diners that served authentic Swedish waffles, and I was lucky enough to live just around the corner from one — Ann Sather. When I first discovered these treasure troves, I thought I had found heaven. I can actually inhale the scent of these wonderful places just thinking about them. You see, some people are egg people. They like omelets or scrambled eggs or Eggs Benedict. Not me! I’m a waffle girl. So when I heard about Swedish waffles, I thought I’d have to try them out to see what all of the fuss is about. My first surprise was that the Swedes do not put syrup on their waffles. Oh no! They’re traditionally served with whipped cream and wild lingonberry jam (affiliate). Plus, Swedish waffles are slightly thinner than the American version so you can enjoy several. Yes, the ingredients for the waffles are important. But just as important is the kind of jam you put on it. Please please please make sure you get the really good stuff, such as Felix Lingonberry Jam. Now, I love celebrating International Waffle Day as the next person (which is March 25), but really, any day is a good day for a true authentic Swedish waffle. So let’s get baking! 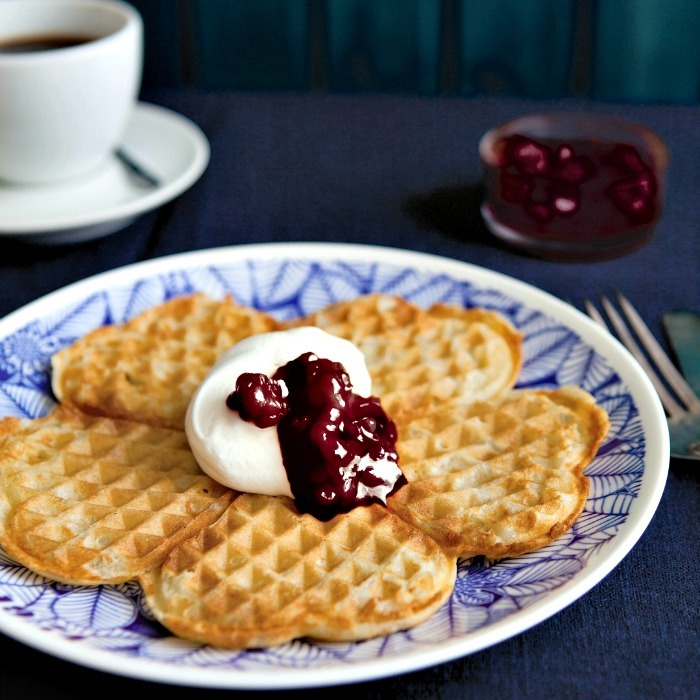 This easy, delicious recipe for authentic Swedish waffles is from the chefs at Felix Lingonberry Jam in Sweden. Whip together flour, baking powder and salt with half of the milk until you have an even batter. Pour in the rest of the milk, eggs and the melted butter, whip until thoroughly mixed. Heat the waffle iron and brush with butter. Pour in 6 tablespoons of batter and bake until golden brown. Serve with whipped cream and Felix Lingonberry Jam. I have to head to Ikea to get some lingonberry jam to make these. I love the idea of breakfast dates! How fun 🙂 And I hope you enjoy the Swedish waffles recipe… it’s soo good! Looks yummy! I love visiting Solvang which has every Swedish & Danish pastry & waffle you can imagine. Isd love to make homemade. Thanks for sharing your recipe at the Inspiration Spotlight party. Shared. Oh my! These look fantastic and lucky for me, my family is most definitely a waffle family! I am thinking we might have to give these a try this coming Saturday. Than you for sharing! These look so so yummy! Our family loves waffles, the crunchy outside with the flaky inside. Yummy! These sound like such a treat. I think they would be more crispy and less doughy then the American version. Sounds yummy. Your Swedish Waffles are great! Hope you are having a fantastic day and thanks so much for sharing with Full Plate Thursday.